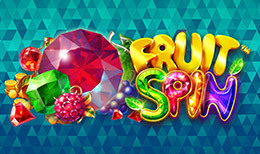 Fruity themes are common in slot games, with many retro and classic games featuring fruit motifs on their reels. This release from NetEnt is rather different, though. All of the fruits players will see in this game are actually gemstones, which gives a much higher value that what you find in the fruit bowl at home. These shimmering jewels are incredibly appealing, especially when you consider the wins possible in this game. So make sure you get your five a day! Place your deposit and start spinning to get a bit more fruit in your diet. There are 5 reels and 4 rows in this slot game, giving players a whole 40 possible paylines. The bright colours and sparkle of the gemstones is incredibly appealing and clearly executed with care, what with the fine detail visible in the symbols. The background is a soothing web of blue and turquoise triangles, which makes the colours in the symbols really stand out. There’s a big selection of higher value symbols, including limes, blackberries, cherries, oranges, raspberries and a range of gold and silver bars. Players will know when they land a wild, as the word ‘Wild’ sits on top of a large emerald. The scatter has a similar design, but it’s a ruby instead. The wild substitutes for all symbols apart from the scatter, and both of these symbols only come in large blocks spanning at least 3 reels and rows. The bonus feature is called Lucky Wheels, which is triggered by landing a whole row of scatter symbols anywhere on the board. When this happens, you are given spins on the lucky Wheel. Players also receive free spins for landing at least 3 of the scatters. This is a great feature that makes the game stand out from other fruity offerings. NetEnt takes a classic game theme and kicks it up a notch with the shimmering design that properly evokes the urge to win. There are no rotten bananas or sour oranges here, instead you are presenting with a dazzling array of jewels and precious metals. The large wild and scatter symbols can be particularly lucrative, and the Lucky Wheels bonus feature is great. It’s not the sort of thing often seen in slot games. This is an appealing game from an experienced developer that honours slot game traditional design, but firmly updates it for the present. What a great way to up your fruit intake!